Last night I wanted to watch a light hearted movie that didn’t demand a huge amount of brain power from me. Having spent the day working on my novel I was exhausted, with half my brain in the current moment and the half trying to figure out how to plug a plot hole that was driving me nuts. I flicked through the movie channels on Foxtel and came across The Jane Austen Book Club. The story of six people who join together to discuss one of Jane Austen’s novels per month, while dealing with their own relationship issues. It sounded just the ticket. The Jane Austen Book Club tells the story of six people going through their own relationship issues. The film opens with Jocelyn burying her long-time companion – a dog – in a lavish funeral. After the funeral Daniel tells his wife Sylvia he wants a divorce, that he’s having an affair with another lawyer in his firm. Bernadette decides the best thing for everyone is to create a book club to discuss the works of Jane Austen. Allegra (Sylvia’s daughter) and uptight French teacher Prudie are invited by Bernadette to join the club and while away at a Dog Breeders convention Jocelyn meets the handsome Grigg who she invites to come along with the thought that what Sylvia needs is a good old fashioned fling with a younger guy to help get her mind off Daniel. Each of the characters in this delicately paced romantic comedy come to the Jane Austen Book Club with their own baggage. The film is a wonderful, light-hearted character study of 6 people looking for love and acceptance, set against the backdrop of monthly discussions of the works of Jane Austen. As the film progresses the lives and loves of the cast move through a series of false-starts and heartbreaks, ending with the everyone exactly where they should be. 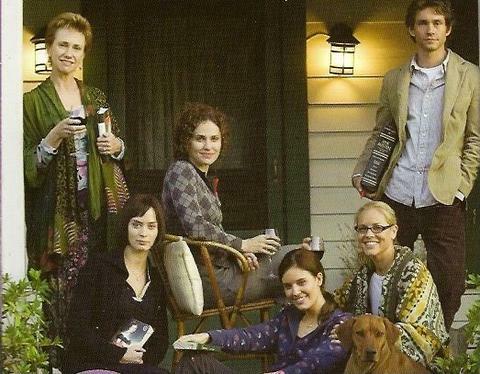 The Jane Austen Book Club gathered a wonderful cast of actors to portray the characters and each character has an interesting journey that holds the viewers attention through out the film. It is Bernadette, played by Kathy Baker who takes the prize as the films anchor. The six times married Bernadette, on the look out for husband number seven is the epitome of love as a driving force in happiness. The Jane Austen Book Club is a perfect Sunday night movie. Not too taxing on the brain, enjoyable characters in realistic situations, who all ultimately come to the conclusion that love is always worth fighting for. Pingback: Finding the Rainbow by Traci Borum | My Life. One Story at a Time. Previous PostI Fought the Muse, and the Muse Won.